Actor Gene Autry, also known as the "Singing Cowboy," starred in Western movies from the 1930s to the early '60s. He won two Grammy Hall of Fame Awards for his work. Born on September 29, 1907, in Tioga, Texas, Gene Autry was discovered by Will Rogers in 1926. Autry sang on the radio in the early 1930s. In 1935, he had his film debut in The Phantom Empire. Tumbling Tumbleweeds, filmed that same year, was the first Western musical. Autry became known as the "Singing Cowboy." His self-titled television show ran for six seasons. He died in 1998. 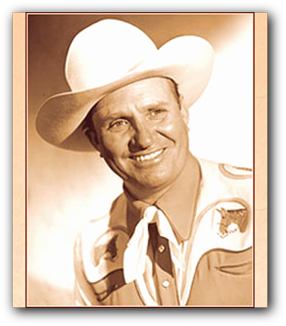 Known as the "Singing Cowboy," Gene Autry was born Orvon Gene Autry on September 29, 1907, in Tioga, Texas. He was only 4 years old when his mother died. Soon after losing his mother, Autry moved to Oklahoma, where he began singing in church. He later learned to play the guitar, too. When he was 16 years old, Autry went to work at a local railway station. He soon switched to manning the telegraph line at different stops along the railway line. One night, he played for a customer who told him that he had enough talent to get a job on the radio. The meddling customer turned out to be actor Will Rogers, and Autry soon quit his job to find work in the music business. In 1950, Autry became a star in an emerging medium. He produced his own TV series, The Gene Autry Show, which enjoyed six successful seasons on the air. By the early 1960s, Autry had largely retired from acting. He devoted much of his time to his numerous real estate and media ventures. Autry lost his wife in 1980. The following year, he married Jacqueline Ellam. Autry worked to preserve some of America's past with the Autry Museum of Western Heritage, which he established in 1988. Many of the items featured in the museum came from Autry's own collection of memorabilia. It is now known as the Autry National Center of the American West. The winner of two Grammy Hall of Fame Awards (in 1985 and 1997), Autry is the only entertainer to boast five stars on the Hollywood Walk of Fame, for his work in motion pictures, radio, music recording, TV and live theater. Autry died on October 2, 1998, in Studio City, California. He was 91 years old. In 1927, Autry landed his first radio job as "Oklahoma's Yodeling Cowboy" on a Tulsa station. He scored his first hit the following year with "That Silver-Haired Daddy of Mine," which he wrote himself. Autry soon landed a regular spot on the National Barn Dance, which a show that was recorded in Chicago, Illinois. Around the same time, he married Ina Mae Spivey. In the mid-1930s, the couple headed west to conquer Hollywood. In 1935, Autry signed with Republic Pictures and made his major film debut, The Phantom Empire. That same year, Autry starred in Tumbling Tumbleweeds (1935), the first Western plotted around the main character's ability to sing, and thus became credited with creating the musical Western. His other films include The Singing Cowboy (1937), Rhythm of the Saddle (1938) and Sioux City Sue (1942). Autry was also a savvy businessman, developing and promoting his own lines of western-themed merchandise. During World War II, he took a break from his career to enlist in the U.S. Army Air Forces, serving as a pilot from 1942 to '45. He returned to the music charts in 1949 with the holiday classic "Rudolph the Red-Nosed Reindeer."